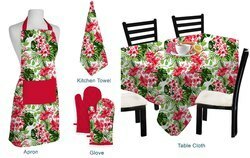 We are engaged in providing a wide assortment of Cotton Kitchen Linen Set and table items with the help of our skilled craftsmen availed in various vibrant colors and unique designs as per the clients needs and requirements. These are made of qualitative and super absorbent fabrics which are highly acknowledged. 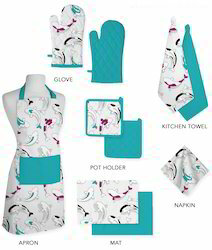 Size any specified sizes can be done. Wash Care Instruction Machine Wash Cold. Tumble Dry .Hand wash, Machine-wash hot. 100 % Cotton with Embroidery & weaved. Which is a hand weaved & power loom weaved . It is considered to be a "high end" fabric, this is a cotton yarn are used with good color fastness property. Wash Care Machine Wash Cold. Tumble Dry. Handwash. Machine wash hot. Our offered kitchen set with Design Apron and curtains are appreciated by clients due to their decorative aspect and functionality. These products are offered in various shades, prints, design patterns and weaves. 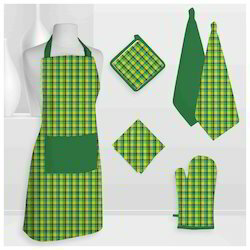 Our products are widely used in homes kitchens, restaurants and hotels for their practical usage. 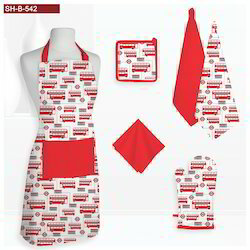 Knowing us as one of the leading companies, we are engaged in offering an extensive range of Cotton Apron to meet the needs of our customers. These products are quality tested on various parameters by the quality inspectors and are authenticated as per the international standards. 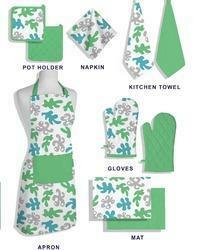 These aprons are easily tied and are easy to wash as well. 100 % Cotton with Weaved striped pattern. Which is a hand weaved & power loom weaved. It is considered to be a "high end" fabric, this is a cotton yarn are used with good color fastness property. 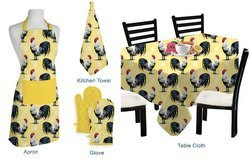 We introduce ourselves as a prominent manufacturer and supplier of an extensive array of Kitchen Linen. This product is stitched by our experts using premium quality fabric and sophisticated technology. 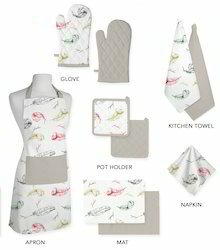 The offered range is made available in various sizes and designs for our clients to choose from. 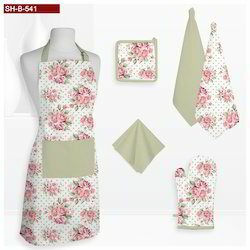 Our precious clients can purchase this product from us at reasonable prices. 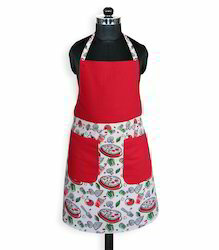 This yarn dyed plain cotton Apron make the perfect accompaniment when preparing any meal. Its construction features Western look faithfully rendered in a beautiful check. 100% cotton. Dimensions: 27 in x 35 in Machine wash tumble dry. 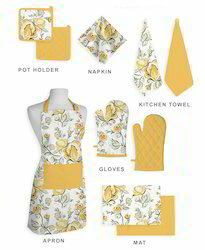 Looking for Cotton Kitchen Linen set ?